Failure of the Afghan peace process will harm Pakistan’s credibility to a great extent. The Afghan peace process, which is being facilitated by various regional states, has once again hit a roadblock with the Afghan Taliban refusing to hold direct peace talks with the Afghan government. A statement issued by the Afghan Taliban recently stressed several long-standing preconditions for dialogue, including the departure of all foreign troops from Afghanistan. “We want to repeat our stance once again that until the occupation of foreign troops ends, until Taliban names are removed from international blacklists, and until our detainees are released, talks will yield no results,” the group said. Direct talks were expected to begin in Pakistan next week between the Taliban and Afghanistan, Pakistan, China, and the United States (the so-called Quadrilateral Coordination Group). Last year’s attempt at talks dissolved after just one round, after Afghan intelligence announced that Taliban leader Mullah Mohammad Omar had been dead for two years. In a way, Pakistan may have jeopardized the latest round of talks. 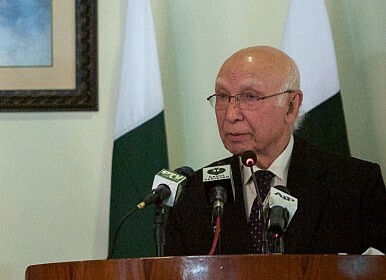 The Afghan Taliban’s announcement came only a few days after Pakistani Foreign Affairs Advisor Sartaj Aziz, in a rare admission, said that Pakistan still had significant influence over the Afghan Taliban because the group’s leadership is based in Pakistan. Previously, Pakistan has always denied any such claims. This statement by the county’s foreign affairs advisor has raised many questions. On Pakistan’s part, the motives of this admission are unclear. If it was meant to bolster Pakistan’s general position over the issue, it has clearly failed. And if it was meant to sabotage the peace process, it has succeeded in doing so. Moreover, by openly admitting that the Afghan Taliban’s families live in the country, Pakistan has only officially acknowledged what has already been known: that the group enjoys state-level support in Pakistan. Moreover, it has further confirmed that Pakistan has been following a ‘good’ Taliban (non-state actors which do not target Pakistan’s interests) and ‘bad’ Taliban (non-state actors which target Pakistan interests in any way) policy. Strategically, the Afghan Taliban is under no pressure to join any peace process. Since the withdrawal of international forces from Afghanistan a year ago, the Taliban have had many victories on the military front: insurgent activities increased considerably in the last year, with at least 10,000 security and terrorist incidents recorded in 2015 alone. This latest refusal by the Taliban to join any dialogue has weakened Pakistan’s position. From here on, Pakistan’s credibility will further decline as it has not yet been able to deliver on the issue, despite making promises to do so at various forums. The Taliban have even promised to launch more attacks because of the growing number of foreign troops in the country. In the coming days and weeks, the security situation of Afghanistan is likely to deteriorate further, which will only put more pressure on Pakistan. Make no mistake: the stability of the region depends on the outcome of this peace process and Pakistan needs to take a clear position on it. Road to Quadrilateral-Backed Peace Talks Uncertain as Taliban Refuse to ParticipateThe Afghan Endgame: What, When, and HowThe Afghan National Unity Government’s ‘China Card’ Approach to Pakistan: Part 2Why the Taliban Are in Control of the Afghan Peace ProcessUS-Taliban Talks: To What End?